If you are a salaried employee the next 1 month is when your company’s HR/Payroll department keeps bugging you for your tax savings. And many employees haven’t done any investments for tax savings for this year or haven’t completely maxed out your 80C. If you also belong to that camp, there would be some colleague or friend who would try to sell you some LIC policy or a ULIP policy. But you know that you handling your insurance and investment yourself will lead to much better returns than buying an ULIP at the last moment. If you checked my previous article comparing ULIP vs ELSS mutual funds you see that I suggest taking a term insurance and then doing a monthly SIP into a ELSS fund. Doing a monthly SIP would protect you against the ups and downs of the market. But since you missed your opportunity to start your SIP at the beginning of the financial year, you are now stuck with buying your fund at a lump sum amount. If the markets fall down after you just bought your fund, you will be at a significant loss. But there is a solution to that too. I am assuming that you have not done any of your 80C investments and you have 1.5 lakhs ready to be invested. If you are contributing to an EPF (Employees Provident Fund) then subtract that total amount for this year from 1.5 lakhs and likewise subtract any life insurance premium you have paid. If you don’t have a life insurance yet and you have others who are financially dependent on you, you need a term insurance first. There are numerous websites where you can search and compare different term insurances. Two of the popular ones are Policy Bazaar and the new CoverFox. First decide on a sum assured value which needs to be at least 10-12 times your current annual income. So if your annual salary is 10 lakh, your cover should be 1.2 to 1.5 crores. Choose whichever policy is lowest price and has a decent claim settlement ratio. You won’t need any of the fancy riders or add-ons to your policy. Buy your policy online and you will be asked numerous questions. Please fill it in accurately. You would also be asked to do a health checkup (which is mostly to detect if you are a smoker or not). After all those are done, your policy document will be emailed and also sent by post to you. Now your insurance is done so you can subtract the amount you paid as premium from the 80C 1.5 lakhs limit. Next is investing into an ELSS fund. There are numerous ELSS funds and it is difficult to choose a good ELSS fund these days. You should get a professional financial advisors help if you can’t choose one yourself. But if you can spend a few hours you can identify good funds yourself. Goto websites like ValueResearchOnline and search for a section called ELSS. It would have different funds that are sorted by star rating. Just ignore the star rating. Instead check for funds which has consistently performed well and given good returns even if the market is not doing good. Those fund managers know how to really pick the right stocks to invest in even if the market is on a downtrend. You can also check what kind of companies that fund invests in and how it has performed over the past 5 years. There are also neat graphs to show how an SIP in that fund would have performed. Now we unfortunately can’t do an SIP today as we don’t have enough months remaining in the financial calendar. 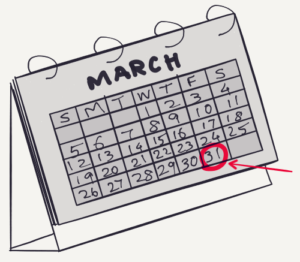 But we have enough weeks remaining – and as of Monday (Jan 30), exactly 9 weeks to March 31. Lets assume that you have to invest 1.4 lakhs into ELSS dividing it by 9 weeks, you have to invest Rs.15,555 per week into the fund. I can hear you asking that there is no SIP option for weekly period. Does it mean you have to login to your mutual fund website and manually invest in the fund every week? You can do that, but No. There is an easier way. For this week, invest the first week’s amount manually. Then in the same fund house choose a Liquid fund. Make sure that the fund has no exit charges. Put your entire money into that Liquid Fund and search for an option called STP and set it up to transfer the weekly amount from the Liquid Fund into the ELSS fund on a specific day of the week. STP means Systematic Transfer Plan. It is an easy way to transfer money from one fund into a different fund within the same fund house. STP allows you to transfer money weekly, fortnightly, monthly or quarterly. Once you have set it up, transfers money from the Liquid Fund into the ELSS fund (just like you would have done a monthly SIP from your bank account to the ELSS fund). And since you are doing a weekly transfer, even if the markets fall after week 1 or 2, you will be able to capture the fall over the next weeks. And the best part is once you have set it up, you wouldn’t have to lift a finger as everything is automated. End of the March you would have invested all your 80C money into an instrument which is both tax efficient and also have protected it against the market volatility. Don’t forget to setup an SIP per month for the right amount from April 2017 to Mar 2018 (or till any year you want to). Remember to use this STP only if you haven’t done your full 80C savings this year. Doing your regular 80C investment via STP instead of SIP would also work, but if you forgot to put in the money in your Liquid fund your STP would stop and you wouldn’t remember to check it. Instead go for a simpler SIP as the difference between a monthly vs weekly investment wouldn’t be too much over the long run. At least from the next financial year onwards be more regular in your investments and make sure you don’t get stuck with a bad investment at the last minute. If you have any other ideas on savings tax better with only 2 months remaining, please comment below. PS: This is just a simple idea for people to invest at the last minute. Each person’s financial situation might be different. Please get in touch with your financial advisor (you do have one right?) or email me at srini@getricher.in for help.